BÉNÉVOLES long terme nécessaires ASAP! Sur mai 17e 2016 we welcomed new members in our Bali Wildlife Rescue Center (BWRC). The animals arrived at our place right before sunset. 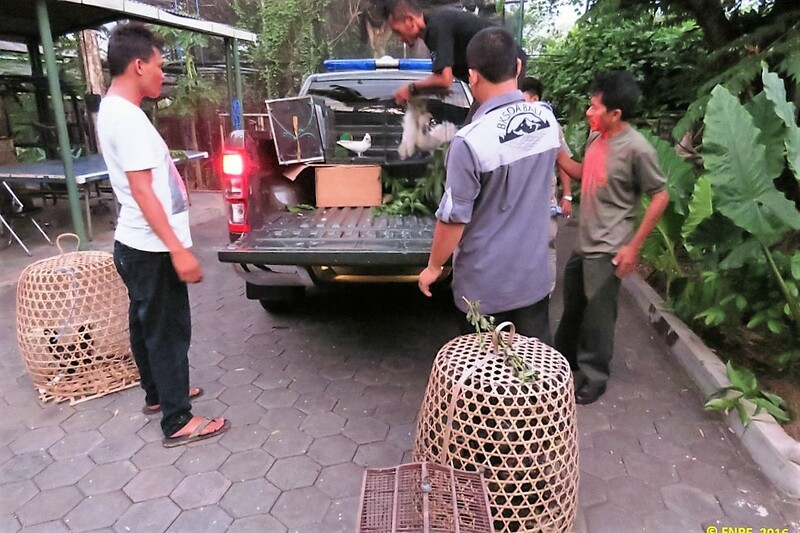 They were brought on a pick-up truck by the local park ranger (known locally as Polisi Hutan). The animals were confiscated by the Indonesian Nature Conservation Agency (also known as BKSDA). 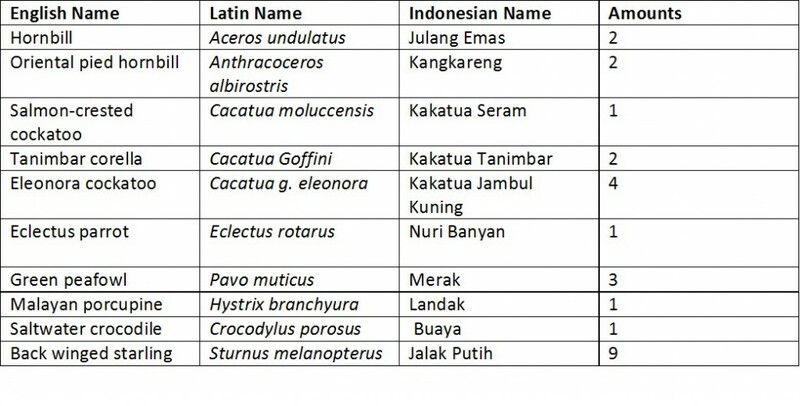 Il ya 18 animals whereof some of them are protected by Indonesian law. Another 8 animals arrived on May 26e 2016. 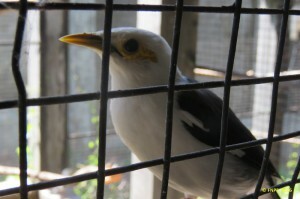 Most of them were confiscated by BKSDA from the local people who keep the birds for various reasons. In total there are 26 animals from 10 different species. From those numbers, several of them are considered endangered. L' Tanimbar corella is considered as nearly threatened while the Salmon crested cockatoo is considered as vulnerable. The most endangered species of them all is the Black winged starling which is considered as critically endangered. New members are arriving to our center. The story behind each animal is still a mystery. When our staff tried to investigate about their story, all they found are unreliable rumors about the origins of the animals. All we know is some of the animals were kept in cages as pets while others were destined to be moved somewhere else. 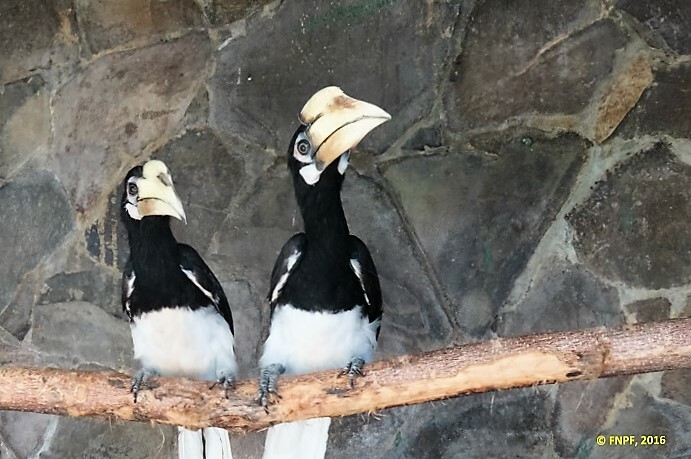 Two hornbills are adapting to their new home. We are very happy to receive 9 Black winged starlings from BKSDA. This bird is considered very rare in the wildlife and very expensive in the black market. Its popularity is due to its rarity and its beautiful voice. Conservation work for this bird is very difficult because not only it is hunted to the brink of extinction but also its habitat was destroyed due to changes in agricultural practice in the Island of Bali and Lombok. Thankfully with the support from Humane Society International of Australia we can take care all these animals and release them in the future. We also want to say our highest gratitude to BKSDA who has been working hard with FNPF on protecting the wildlife in Bali. One of the new Black winged Starling. Interested on helping at BWRC? Cliquez ici. Cliquez ici Pour plus d'informations sur les diverses façons de faire un don, y compris les Dons déductibles d'impôts. Cliquez sur le bouton ci-dessous pour faire un don via Paypal ou carte de crédit. Tous année des centaines de personnes de partout dans le monde viennent à l'Indonésie de faire du bénévolat avec nous à Bali et à Kalimantan. Comme il? Envoyez-moi une ligne.